Creating fantastic coffee is absolutely effortless with the Mini Me® Automatic. Boasting a compact design that packs in a maximum 15-bar pump pressure, as well as a Play and Select feature for extra ease of use, this brilliant little machine won’t fail to impress. Striking shades of white and grey add an extra layer of style to its unmistakable design. Just like all our other machines, the Mini Me® will take any NESCAFÉ® Dolce Gusto® coffee pod or capsule and turn it into a hot or chilled drink in moments. 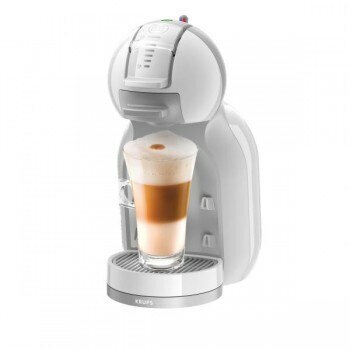 With a wide range to choose from, from classic coffees such as Lattes and Cappuccinos to spiced teas and hot chocolate, this automatic coffee machine is great for any occasion, at any time of the day. With many pods available in supermarkets and even more exclusively online, you’re sure to find something that suits you. Plus, if you love the two-tone design of this machine, we think the Mini Me® in red and white might also be your thing. Easy to use and clean, you won’t compromise on convenience. With a 2 year guarantee, there’s no reason to stick to instant every time. So choose the Mini Me® and get ready for a new world of taste – coffee will never be the same again!